The Cameron women’s basketball team hosted Sunday Sundaes, an-all-you-can-eat ice cream social and fundraiser, on Sept. 23 in the Aggie Gym. The players served up ice cream and toppings to students, family, friends, fans and boosters. This was the first ever Sunday Sundae ice cream social for Cameron’s woman’s basketball. The teams scheduled the event just prior to the start of the new basketball season. Head Women’s Basketball coach Emma Andrews said she hopes they can continue hold the meet and greet in the future. 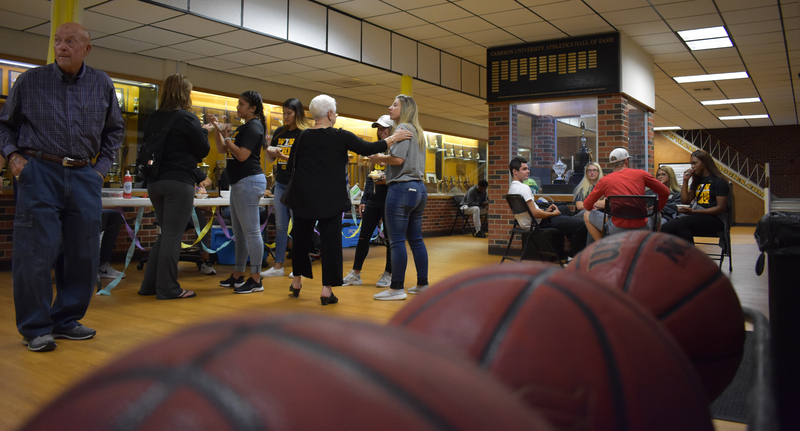 Cameron University senior and forward for the women’s basketball team Lejha Smith said she thinks this event will help bridge the gap between players and fans. “I think it’s cool because a lot of people come to the ball games, but they may not know the players or they may have never interacted with them before,” she said. Though the event is a fundraiser, Smith said it was more so about building a sense of community. Andrews echoed her player’s sentiment. For more information about Cameron women’s basketball contact Sports Information Director Kenton Means.